AUBG alumna Nikoleta Morales (‘08) is an award-winning journalist and PR specialist whose portfolio includes interviews with some of the world’s biggest celebrities. Upon acquiring a BA degree in Journalism and Mass Communications at AUBG, Nikoleta, who is originally from Bulgaria, moved to the U.S. to pursue a master’s degree in Journalism at Roosevelt University in Chicago. 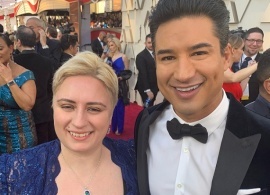 She has ever since been living and working in the U.S., and she recently attended and covered the Oscars ceremony 2019. What was your first destination after AUBG? After I graduated AUBG in 2008, I left to do my Masters in Chicago at Roosevelt University. I majored in Journalism again as this is what I wanted to do for the rest of my life and career. What have you been up to ever since: where have you lived, studied and worked? After I graduated AUBG, I moved to live in Chicago. I also traveled around the U.S., the Caribbean, and Canada. I studied at Roosevelt University where I graduated in 2010 with a Masters in Journalism. I also became a mom in 2010 blessed with a beautiful daughter who is 8-years-old now. While at the university, I interned at the Daily Herald as a photojournalist and I was the photo editor of the Torch. After I graduated, I started working for a Bulgarian publication called BG Voice and freelanced for other publications for a while. Then, I got the opportunity to work as a publicist for one of the most famous attorneys in the U.S., Jeffery M. Leving, who taught me the ins and outs of marketing and PR. I also worked as a Managing Editor for Extra Newspaper during 2012-2014 where I won a few journalism awards, some of which were for my entertainment stories. It was then that I fell in love with entertainment journalism and found my passion and calling in it. I also worked as a PR for the Purple Group and My Why Agency where I worked with big clients, such as ComEd, MadeGood, and others. I developed my entertainment blog in 2017 where I started publishing interviews with celebrities ( nikoletamorales.blogspot.com), which won first place at this year’s IWPA competition. I also work as a freelance publicist with celebrity clients, such as the actress Yelyna de Leon ("Will and Grace"), singer Jennifer Hill, the film "Murder in the Woods" starring Danny Trejo, Kade Wise ("Empire”) and Chelsea Rendon ("Vida"), the British Genuinely You Movement, among others. I am a Senior Associate Writer for FF2 Media, an entertainment writer for Montana Press and Cultured Magazine NY. In addition, I do PR for the Purple Group in Chicago. What do you consider to be some of the highlights of your professional career so far? I won three first places at this year's IWPA journalism competition for my blog, stories, and PR. I also covered the 2019 Sundance Film Festival in Park City, Utah, where I personally met and made connections with OWN, and I also attended and covered the 2019 Oscars for the first time for FF2 Media. In 2018, I represented the film "Murder in the Woods" as their official publicist at the Chicago Latino Film Festival where we created such a buzz that we sold out all the screenings and I organized their red carpet and social events. That's when I met more directors, such as Alejandro Paesa, who asked me to represent his film "Cuernavaca" as his publicist. Throughout my journalism career I have interviewed and met a lot of legends and celebrities like Alicia Silverstone, Lou Ferrigno, Mario Lopez, Eva Longoria, Mike Tyson, Messi, Lady Gaga’s Producer Mark Ronson, Paul Chavez (Cesar Chavez son), Martin Luther King III, Gabriel Iglesias, Marlon Wayans, Marc Anthony, Ana Ortiz, Jaime Camil, Il Volo, Rob Schneider, Chris Kattan, JLo’s dancers, Anna Faris, Kellan Lutz, fashion icon Carolina Herrera, UFC fighter Holly Holm, Jason Derulo, Paula Abdul, the Cookie Monster and Maria from “Sesame Street,” and the American rock band Blondie. I was also the only female to cover and take photos of President Barack Obama when he came down Air Force One to meet with the Chicago Mayor Rahm Emanuel during one of his visits in 2014. Tell us a bit about your experience attending the Oscars and how you got selected to cover the event. 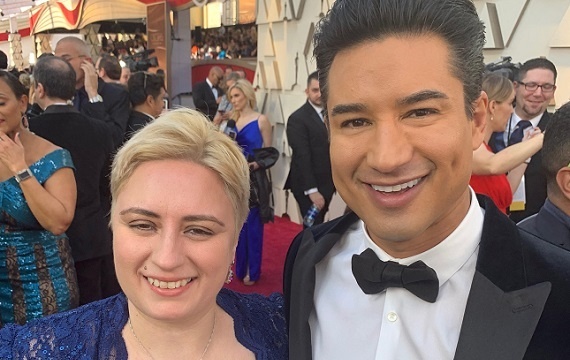 Attending and covering the 2019 Oscars was a dream come true! Being selected was an honor! I applied for media credentials for the first time last year and I was one of the few selected to cover the event. There are over 1,000 applications each year and they accept only 1/3 of those and I was lucky enough to be one of them. I represented FF2 Media for the first time in history! I wrote about my experience on my blog and FF2 Media but in short, I felt like a Cinderella who didn't want to leave the ball. The feeling on the red carpet and the energy were amazing as I was standing on the very same spot where legends have walked for 91 years! I was in the press room where all the Oscar winners came with their Oscars and I got to ask them questions. I was thrilled that I got to see in person one of the female artists I admire - Lady Gaga. After the event, I had the chance to drink coffee on the red carpet as they had a barista there and right next to me was Mark Ronson holding his Oscar and we chatted for a bit. I also stopped and talked to the Best Actress winner - Olivia Colman. I also talked with two other Bulgarian journalists and friends of mine there who were covering for bTV and NOVA TV - Yasen Darakov and Marietta Melrose. Definitely an experience I will never forget! I do hope to make it to the Oscars again next year. In what ways have your AUBG education, experience and friendships had an impact on your career and who you are today? Are you still in touch and collaborating with other AUBG graduates? I loved my time at AUBG! I always think back to the time I studied there. Back then I couldn’t appreciate it as much as I do now. The friendships and memories I made there were incredible and I do miss my time as a student. My journalism professors gave me the base and education I needed to build my career and I fell in love with journalism. I am extremely grateful and thankful for that. If it wasn’t for my journalism professors and my education at AUBG I don’t think I will be where I am today - with all the awards and experiences I have under my belt. I remember being chosen as an Erasmus journalism student in Sweden while at AUBG and that was such a great experience for me. I had so many great memories and times that bring tears to my eyes thinking about them. I made friendships that will last a lifetime and I do keep in touch with other AUBG graduates that are really good friends of mine and even though they are in Bulgaria and I am in the U.S. we never lose touch! Go AUBG! How did you enjoy living in Bulgaria and Blagoevgrad? It was amazing! I absolutely loved it! All the cafes, clubs, restaurants and stores in Blagoevgrad were so fun and made my college days a memorable experience. I always miss my country Bulgaria and I often think of Blagoevgrad with so much love and admiration. I hope many more students will come and experience AUBG, Blagoevgrad, and Bulgaria because it is an unforgettable experience, especially Skaptopara dormitories!